The 8000 C-arm table series has a modular design that allows components to be replaced easily reducing service costs. Lowest Cost, Longest Warranty, Quickest Service, Safest Minimum Height, Highest Weight Limit – Why buy any other pain management table? 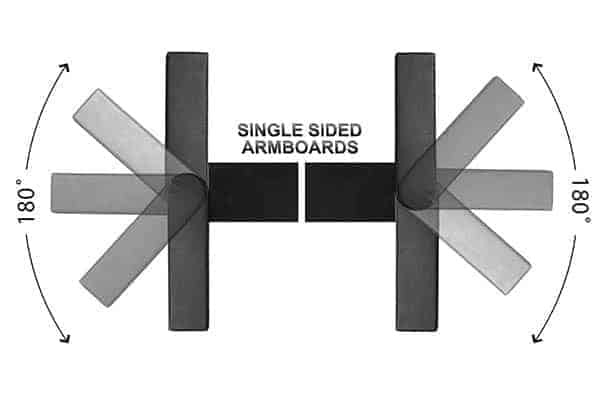 The 6 standard C-arm table top shapes and sizes. Rectangular top – sometimes called a square nose. Folding table top – There are also some pain management tables that offer the option of a C-arm compatible, radiolucent folding top for facilities with a limited amount of storage space. Custom width and length C-arm Table tops are also an option. The most popular pain management table top sizes are 22 inches or 24 inches wide, and 80 to 82 inches long. The pain management tables that have longer table tops than 82 inches typically take up a lot more floor space, but most add little if any additional metal free C-arm imaging area. These are usually the older table designs. If the fluoro table top is narrower than 22 inches, many pain management physicians find that some of their bariatric patients may feel uncomfortable and unsupported. If the fluoroscopic table top is wider than 24 inches, the x-ray technician may find it difficult to rotate the C-arm around the patient unless you have a C-arm similar to the OEC 9800 or OEC 9900 super “C” C-arms. The most popular shape for a C-arm table top is the cervical shaped top with a patient facial access cutout. They will allow you to get closer to your patient so you can maintain a more comfortable position throughout the pain management procedure. Rectangular (square nose) C-arm imaging table tops without the facial cutout (sometimes called square nosed tops) are the original, more traditional choice. They support the patient’s arms when they’re placed above his or her head in a diving position and they are easier to use for non-prone, fluoroscopic procedures. The rectangle shaped imaging table tops are also more useful if you are at a multi-specialty facility and expect to place the patient’s feet at the head end of the table for different types of procedures. 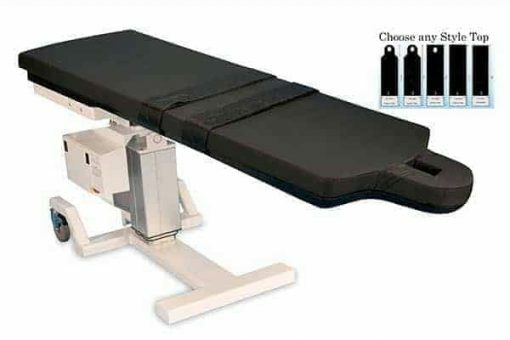 Radiolucent Composite table tops for pain management procedures are normally about $1000 – $1500 less than the carbon fiber C-arm table tops. They have a thin metal edge that normally does not interfere with any useful APs, laterals or oblique views when imaging the spine. The are recommended for any image guided procedures where the surgeon will be using the C-arm on the edge of the table. 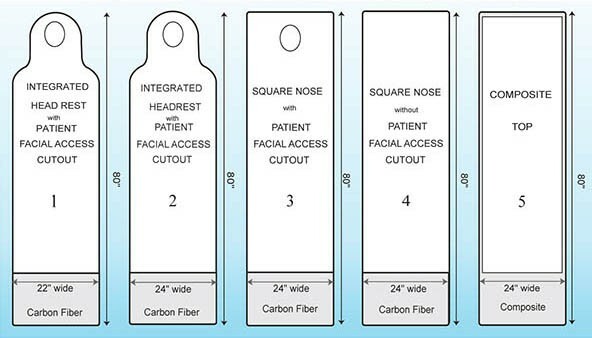 They also do not have the option for a patient facial access cutout and they only come in the rectangular shape, but you can get them as long and wide as you like. 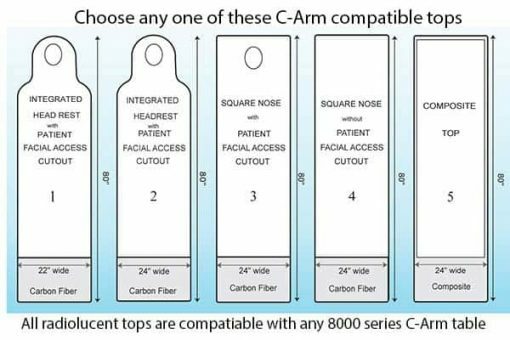 C-arm table tops with a patient facial access cutout can be added to either the cervical or rectangular shaped table tops. The facial cutout which extends through the pad and table top allows for a more comfortable and stable patient position while prone. The patient facial cutout is beveled and produces little artifact during C-arm/pain management procedures.